Whether you’re an enthusiast or a first-timer, having fun, being responsible and being safe are what it’s all about! Being responsible includes finding the right insurance for your motorcycle. 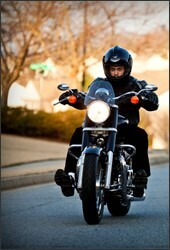 Most people rely on motorcycle insurance to protect themselves against loss in case of an accident. In many states, you must carry basic insurance to cover the cost of losses you cause to others in an accident. If the unexpected happens, insurance gives you peace of mind in knowing you are protected. At Hughes Insurance Agency, we have a variety of motorcycle policy options to meet your needs.